DVariety's Power of Women luncheon on Oct. 14 was like a magnet for all of the coolest ladies in showbiz. Ava DuVernay was there, as was Helen Mirren, Scarlett Johansson, and Rachel Bloom (who opened up the event with a punchy "We're here to celebrate women and their pussies.") 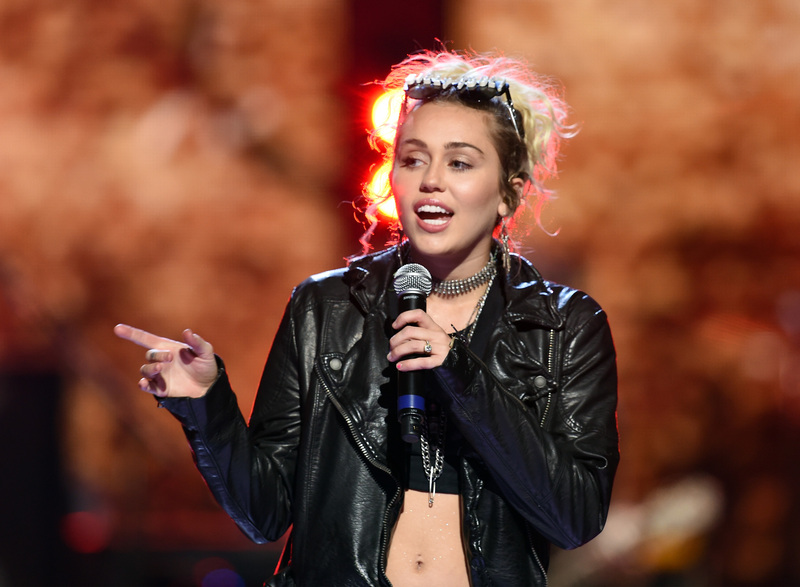 Superstar and Voice coach Miley Cyrus was in attendance, as one of the five celebrities recognized for their commitment to charity. Though Cyrus is definitely more known for her singing and acting career, during the event, she proceeded to deliver an incredibly touching speech that will, hopefully, make her charitable efforts off stage just as well known as her talents are on stage. In fact, Cyrus' Variety Power of Women speech started with her refusing to take the spotlight at all, and instead with her directing the audience's attention to a woman, Jamie, she'd asked to join her on stage. During the speech, Cyrus explained that Jamie is one of the people involved in her Happy Hippie Foundation, which lends support to Hollywood's LGBT and homeless community. The speech pretty much follows this pattern, with Cyrus using the platform the award ceremony has given her to go into details about a foundation that you may not have known about. This made for a great speech: while Cyrus has done lots to promote her foundation via her Instagram account, it was inspiring to hear about the concrete ways in which the foundation is helping the world. The beauty of Cyrus' speech is how she manages to drop so many worthy causes and interesting statistics in such a short time. Bear in mind this speech isn't quite six minutes long: within that time she name checks "the badass Unicef," Planned Parenthood, gives those of us not quite up to speed an eye-opening course in LA homelessness statistics (according to Cyrus, there are "...over 6000 homeless people in LA," and her foundation serves "half of those people and 1,300 trans and gender-expansive people nationwide") and constantly keeps us all thinking about what we can do to make "the world a more loving and accepting place for all." This speech was inspirational to watch, and suggested that Cyrus really does have the right idea about her career: Though she's extremely successful, she's using her spotlight to direct attention to marginalized communities who might not always get the same amount of press attention as a pop star. For that, we should applaud her.